Executive Suites Hotel & Resort is a quiet and peaceful hotel. It’s location is just perfect because its near establishments, shops and restaurants. It has a big parking space. clean & affordable !! this is all a traveler needs and it is what the Adventure Inn offers, it is the second time I stayed on it. 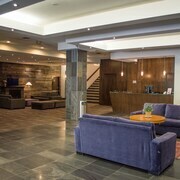 Where to find Downtown Squamish hotels near an airport? 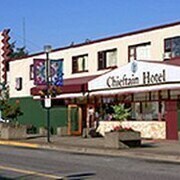 Where can I find hotels in Downtown Squamish that are near tourist attractions? 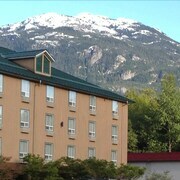 If you choose to book a hotel near the heart of Downtown Squamish, there are several places. There are 9 Expedia-listed accommodation options within a 0.1-kilometre (0.06-mile) distance of the downtown area. Downtown Squamish offers a number of centrally located hotels, such as the Howe Sound Inn & Brewing Company and Chieftain Hotel. 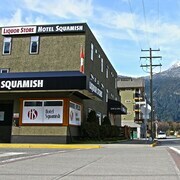 6 kilometres (4 miles) away from the center of Downtown Squamish, is the Executive Suites Hotel & Resort, Squamish. 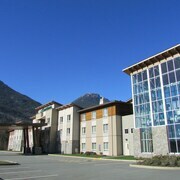 Alternatively, the Sandman Hotel & Suites Squamish is positioned 3 kilometres (2 miles) away. 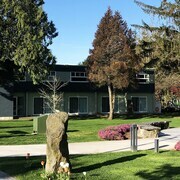 The Sea to Sky Hotel & Conference Centre as well as the Mountain Retreat Hotel are two other recommended accommodation options worth looking into around Downtown Squamish. Time permitting, you might like to explore the other cultural and scenic and cultural delights of Vancouver Coast. Check out Vancouver Coast's old towns and also enjoy its forests, rivers and streams. 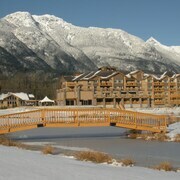 Active travelers can also try snowboarding and skiing here. Vancouver is 45 kilometres (29 miles) to the south of Downtown Squamish and is home to the Stanley Park and Granville Island Public Market. Should you wish to spend a night or two in Vancouver, check out the Fairmont Pacific Rim and Shangri-La Hotel, Vancouver. 45 kilometres (29 miles) to the south of Downtown Squamish, you can also stay at Downtown Vancouver, which is home to the The Residences on Georgia by Vancouver Extended Stay and Rosewood Hotel Georgia. The Pacific Mineral Museum and BC Sports Hall of Fame & Museum are a couple of the most popular places to check out when visiting Downtown Vancouver. Get your fix of local sport with a trip to BC Place Stadium, which is 45 kilometres (29 miles) to the south of Downtown Squamish. Sports fans wishing to stay near to the action can choose from the The Fairmont Waterfront or the Loden Hotel. For those travelers arriving or departing through Vancouver International Airport, you can book a room at Fairmont Vancouver Airport In-Terminal Hotel, or Vancouver Airport Marriott, which are both nearby. What are the most popular Downtown Squamish hotels? 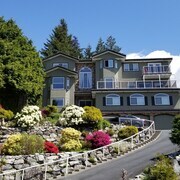 Are there hotels in other cities near Downtown Squamish? What other types of accommodations are available in Downtown Squamish? Explore Downtown Squamish with Expedia.ca’s Travel Guides to find the best flights, cars, holiday packages and more!